The question is a bit rhetorical. But there is no doubt that almost all the oil-importing emerging economies that ran external deficits last year are facing pressure to adjust. India—whose current account deficit looks to have widened to just over 2 percent of GDP. Pakistan, though it is a much smaller economy than the others on this list. Indonesia (no longer an oil exporter). 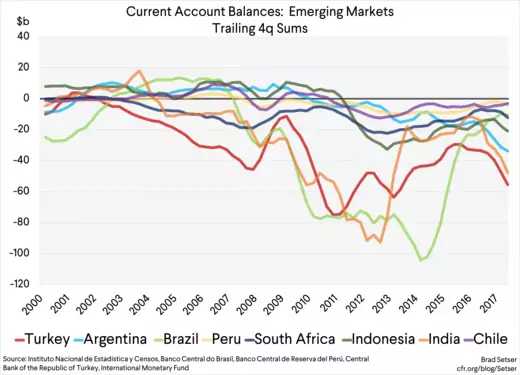 Brazil (though it doesn’t have much of a current account deficit). 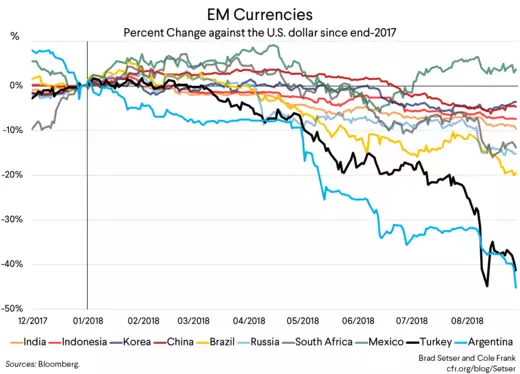 All have seen their currencies fall significantly this year. But that doesn’t mean the pressure on oil-importers to adjust—meaning tighten policies, slow growth, and look more to exports to reduce their current account deficits—won’t have a global effect. No deficits in oil-importing emerging economies and a higher surplus among the oil-exporters (who generally adjusted their imports down after the 2014 oil price shock and now “break-even” with prices in the 50s) means, mechanically, that there need to be adjustments elsewhere. Or one of the big advanced economies now running a substantial external deficit could run an even bigger deficit. The overall deficit of a set of eight relatively large oil-importing emerging economies rose to about $200 billion in the last four quarters of data. The overall deficit of these countries is still smaller than it was in 2013, when the "taper tantrum" forced a significant adjustment. 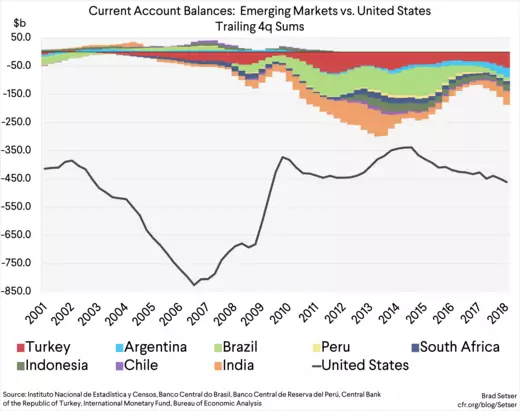 But the swing in the current account balance required to stabilize markets might be about as big as back in 2013 and 2014. And despite Trump’s deeply held view that trade deficits are bad and a sign of “losing”, if "deficit" emerging economies are under market pressure to cut back, the odds are that the United States will end up with a larger deficit. In some sense that’s a safe equilibrium: the United States borrows in dollars, so it is less exposed to the risks created by the Fed’s monetary tightening and a rising dollar than others. Exorbitant privilege and all. * Asia's crisis led to a slump in demand for commodities, which put pressure on all commodity exporters in 1998. Oil was incredibly cheap in 1998. That isn't the case now. The oil exporters are now experiencing a bit of a reprieve after several lean years. ** President Moon of South Korea does seem to be moving in the right direction. But with a 2% of GDP general government fiscal surplus in 2017 (according to the latest IMF WEO data) he needs to go even further. In the first half of 2018, it looks like tax revenue expanded faster than government spending. Both Korea and Germany have a ton of unused fiscal space.